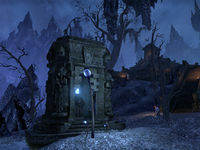 The souls of Argonians are different from those of other races of Tamriel due to their deep, mystical connection to the Hist trees. Sorcerers who specialize in soul trapping have long sought some way to take advantage of this difference. Haj Uxith is an Argonian village in southwestern Coldharbour, southwest of the Library of Dusk. It consists of several xanmeers situated around a Hist tree. This ancient settlement came to Coldharbour during at time of great strife for the Argonian civilisation. The Hist of the tribe made a deal with Molag Bal to transport the village to his realm. 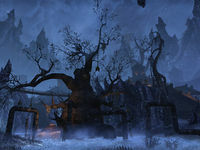 In return, the tribe would allow the Daedra to harvest the tree's sap, however, the crystal provided by Molag Bal which sustains the Hist tree also has poisoned and weakened it. In current times, two factions have emerged in the village over what should be done for their Hist tree. Haj Uxith Objective: Determine the fate of Haj Uxith's Hist tree. Trading Post — A general goods store run by Trader Wanum-Neeus. Trades-in-Cold-Water — A guild kiosk in southeastern Haj Uxith run by Shuliish. 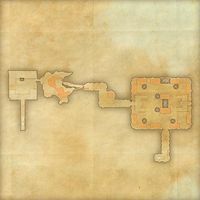 The Haj Uxith Wayshrine is located on the eastern side of the village, not far from the Hist tree. 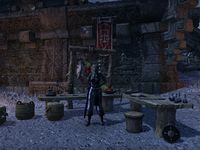 A guild kiosk called Trades-in-Cold-Water, run by Shuliish, is set up to the west of the Wayshrine, on a terrace of the southeastern xanmeer. How We Came to Coldharbour can be found outside the southern xanmeer near Ashgar. The Values of Haj Uxith can be found (?). Warning to Citizens of Haj Uxith, is found inside the northern xanmeer within the Argonian living quarters. The lorebook Chaotic Creatia: The Azure Plasm can be found near Brewmaster Rareel. This page was last modified on 25 January 2019, at 12:23.